Having defeated the Crown in a bloody revolution some two centuries ago, Americans don’t like living under a patriarchy, oligarchy or kleptocracy. Unfortunately, the U.S. central bank, the Federal Reserve, is a little of all three. On Monday of this week, the President of the Federal Reserve Bank of New York stated in a speech that “the Federal Reserve already is very transparent and accountable to Congress and to the public.” Two days later, Wall Street On Parade attempted to get one piece of very basic information from the Fed and got the royal runaround. We wanted to know if JPMorgan Chase, a bank operating under a deferred prosecution agreement for two felony counts and under a criminal investigation for potential currency rigging, was still the custodian of $1.7 trillion of mortgage backed securities owned by the Federal Reserve, as we had reported on November 3, 2014. The Fed Chairman that followed Greenspan, Ben Bernanke, stated that one of his priorities was to “make the Federal Reserve more transparent.” In December of 2013, when we asked the communications office of the Fed for Bernanke’s 2007 and 2008 appointment calendar, we were told we would have to file a Freedom of Information Act (FOIA) request for it – a nuisance stalling tactic for something so basic. When we finally received the appointment calendar, there were redactions of 84 meetings that occurred between January 1, 2007 and the pivotal collapse of Bear Stearns on the weekend of March 15-16, 2008. Bernanke’s calendar for March 7, 2008 shows a full day of appointments blacked out. On Saturday, March 8, Bernanke had an anonymous conference call with unnamed parties. At 11 a.m. the following Monday, March 10, he held a meeting in his office from 11 a.m. to 12 noon but whom he met with is blacked out. One could possibly understand this level of secrecy during the height of the crisis in 2008, but we received the heavily redacted documents six years later. 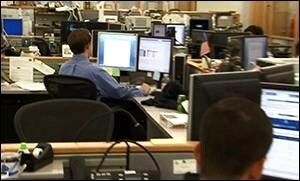 In 2013 Wall Street On Parade attempted to obtain a simple photograph of the trading floor of the New York Fed. One would have thought we were asking for some of the gold from the vault. No photo was forthcoming. Instead, we were forced to spend weeks of research in order to show the public the level of sophisticated trading occurring daily at the New York Fed. In the 100-year history of the Fed, no one was stonewalled to a greater degree than Bloomberg News financial reporter Mark Pittman. On November 25, 2009, at age 52, Pittman died still waiting for the Fed to release the documents he had sought under a FOIA and then through the courts. Pittman’s battle is memorialized in Bloomberg v. Board of Governors of the Federal Reserve System. The case was decided in Pittman and Bloomberg’s favor on March 19, 2010 by the Second Circuit Court of Appeals. Even then, the Fed did not immediately release the documents. In April and May of 2008, Pittman had filed a FOIA seeking details of four lending programs the Fed had made available to Wall Street banks during the financial crisis: the Discount Window, the Primary Dealer Credit Facility, the Term Securities Lending Facility, and the Term Auction Facility. Under FOIA law, the Fed should have responded to Pittman in 20 business days. According to the lawsuit, this is what happened instead: on June 19, 2008, the Fed invoked its right to extend the response time to July 3, 2008. On July 8, 2008, the Fed called Bloomberg News to say it was processing the request. The Fed called Bloomberg again on August 15, 2008 to say that their request was going to be denied by the end of September 2008. No further communication came, including the denial. As Congress conducts further hearings on needed reforms at our Nation’s central bank, its long history of stonewalling the press must be addressed.